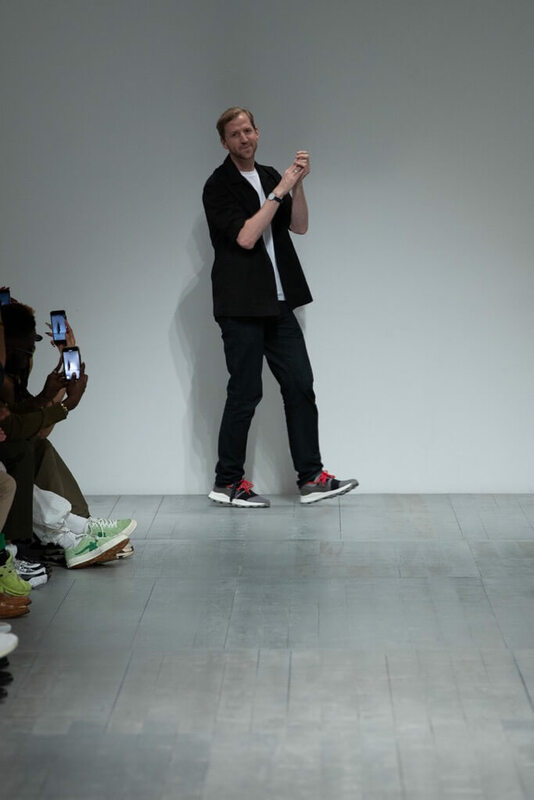 British designer Christopher Ræburn "reacted now" during London Fashion Week Men's, presenting his Spring/Summer 2019 Raeburn collection with a nod toward's current times. Ræburn is a graduate of London's Royal College of Art and has been working with military fabrics, even de-comissioned parachutes – a move that made him one a the leading designers, who is able to put sustainability, as well as functionality and luxury into a look he creates. "React Now", his S/S 19 collection, is about choosing quality over quantity by considering one's consumption in general. It is about shifting seasons, global warming and the changes that we see in this world. "S/S 19 is a reaction to that reality, and the need for a layering system to cater for our fluctuating weather. Protection, on every level, is more important than ever, we’re living in uncertain times, politically, socially and environmentally and this collection started with a stunning RAEFOUND piece; a taser suit originally designed for training allows the wearer to run, fight and function and provides the narrative that asks our wearers to stand for something." Christopher Ræburn reused protective rain capes and parkas to create newer, lightweight and flexible designs, by deconstructing and reconstructing them to fit nowaday's needs. He even cooperated with NASA by using images of melting glaciers from space across pieces made from sand-wash silk, organic cotton and recycled polyester. The mascot for this season is the panda – being not longer endangered – which was flipped upside down on crews and t-shirts. All in all, it is a collection that should make the wearer think about their surrounding, which can be seen in the pieces being kept in black, white and grey tones with only few bright accents, like red for example.